Pretzel Logic's Market Charts and Analysis: SPX and BKX: Has the Second Leg of the Major Correction Begun? 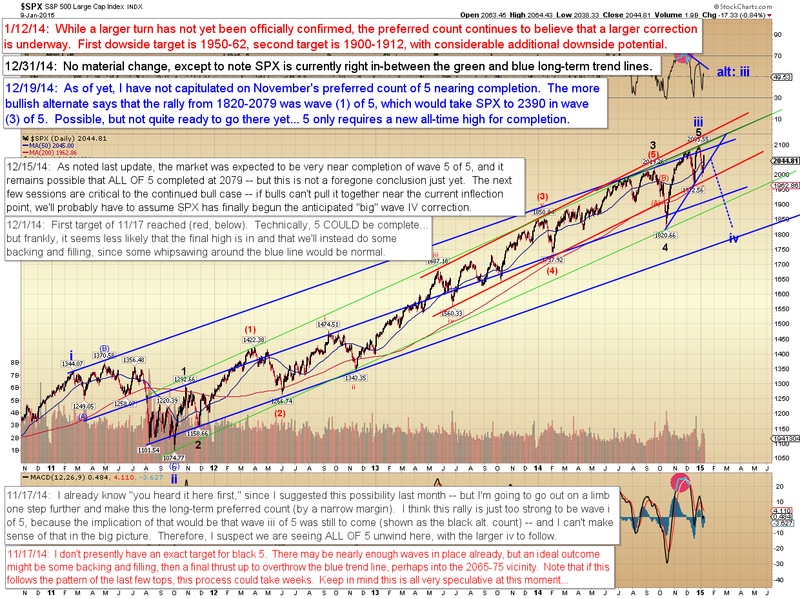 SPX and BKX: Has the Second Leg of the Major Correction Begun? In Friday's update, we discussed that SPX and BKX had reached their upside inflection points, and that both indices were potentially completing 3-wave corrective ABC rallies. In Friday's session, the market began to decline shortly after the opening bell, thereby validating that near-term interpretation. Meanwhile the pattern suggests a near-term rally is an option. In the event such a rally materializes, it would present an opportunity for reasonably low-risk shorts (Note: this is not trading advice! Consult your broker, your banker, your doctor, your lawyer, and your mother-in-law before making any investment decisions. Side effects may include frustration, nail-biting, insomnia, and the sudden urge to check your cell phone repeatedly.). The bull count isn't dead yet, but a rally to 2057 +/- would present risk of approximately 8 points vs. potential reward of 100+ points (big picture, see first chart). 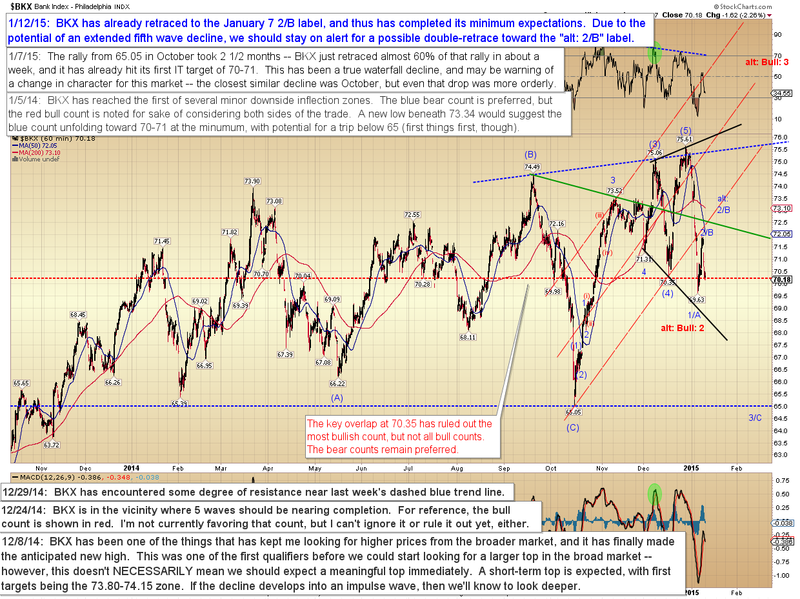 The more immediately bearish count is that (2)/B completed already at 2053. Side Note: It's worth mentioning that this pattern played out to perfection overnight in the E-mini S&P futures -- so futures may have already "done the work" for the cash market. 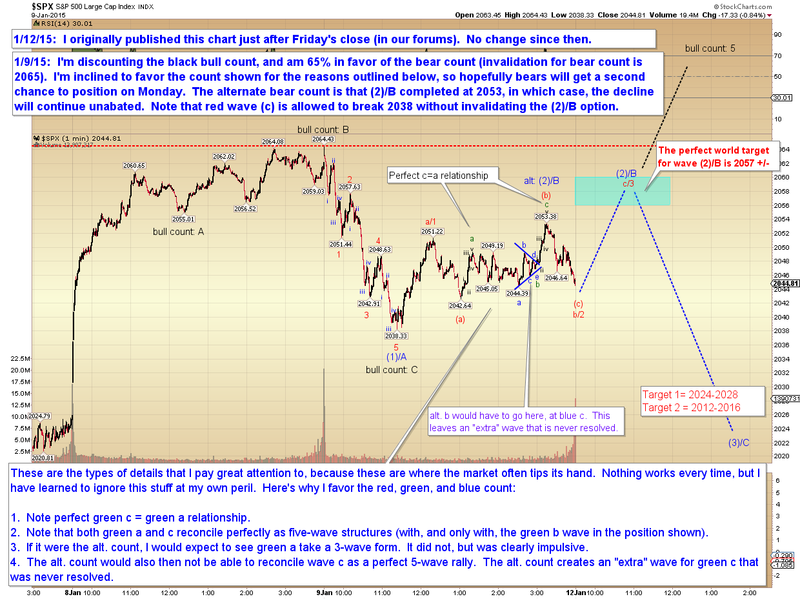 In the event that the market declines directly and sustains trade beneath 2038, then we should probably assume that wave (3)/C is already underway to the downside targets noted on the chart below. Again, the bull count isn't dead yet, but one additional concern bears face is the potential of a complex double-retrace rally, shown in broad strokes via the Philadelphia Bank Index (BKX). In conclusion, intermediate-term, unless and until SPX reclaims 2065, we probably have to favor the view that a decline has begun to 1950-60 -- and beyond. Trade safe.